Today I helped my friend get a new fridge in a house where the widest door was 28″ wide. 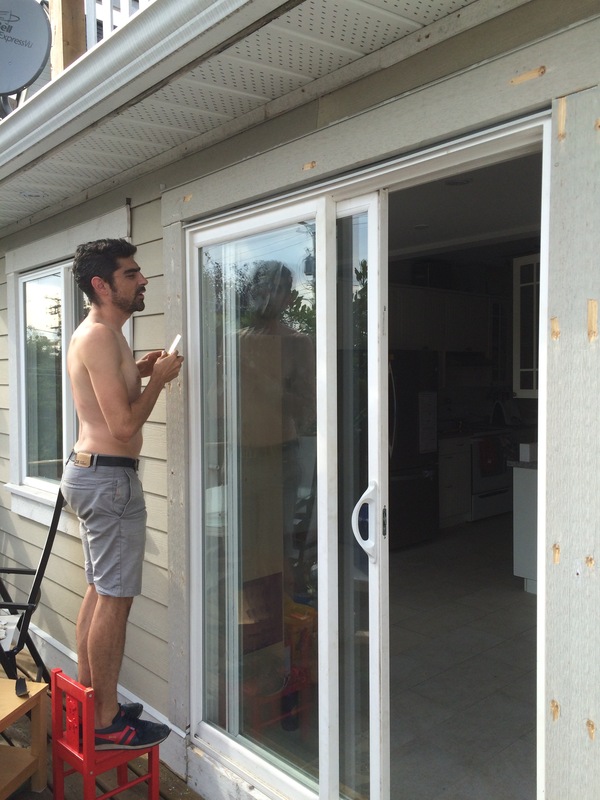 We had to take apart the sliding door. This evening I managed to get a couple hours and I put the unidirectional carbon fibre on one side of the centreboard. I wet the surface with epoxy and the layed it down and squeegeed more epoxy onto the surface. It’s not perfectly smooth, but I’m happy with the result. I’ll be covering it with graphite epoxy soon and that will be sanded smooth. 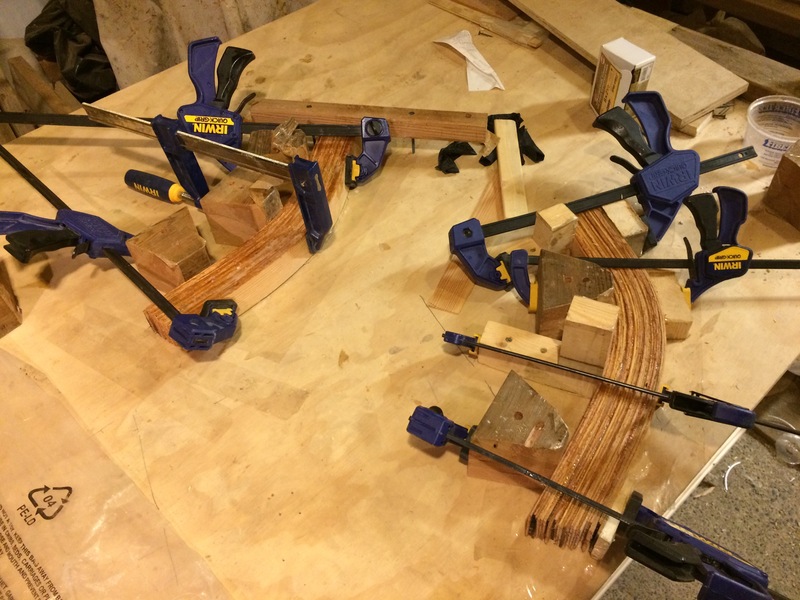 I also started laminating the knees that will connect the thwart to the gunnels. I used 2 1/4 thick fir lamimations left over from making the stems. With some luck ill be able to cut them down the centreline and get two knees out of each one. Having access to a thickness planer makes this activity much easier and more precise. I was able with relative ease to plane the whole length of both the apron and stem down to the specified thickness on my own. I did spend some time fretting about keeping the angles square and not ending up with a weird parallelogram that would give the bow a weird twist. fortunately the thickness planer coupled with a square and some judicious hand planing kept everything progressing smoothly. When planing the apron down to the right 2″ thickness i was sure to keep checking that it was square. 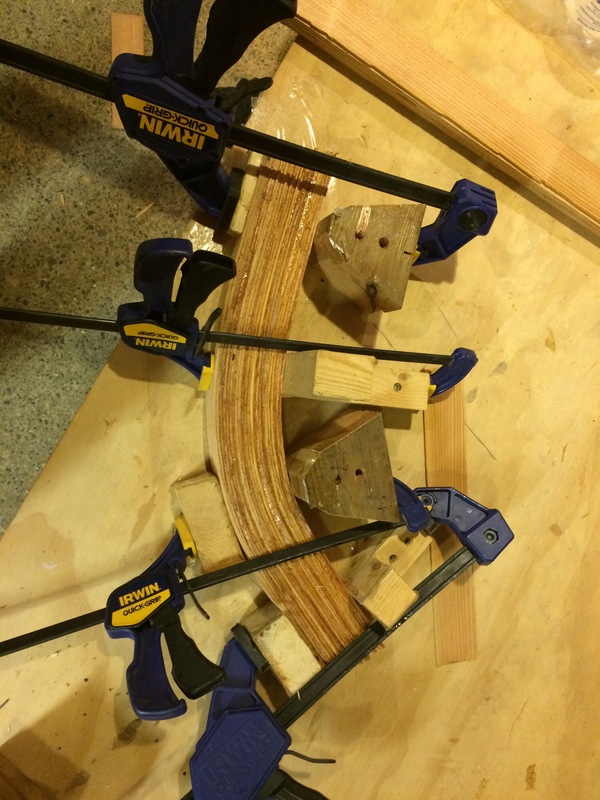 When I ripped the strips for the bow stem I was not sure what the appropriate thickness would be so I played around with everything from 1/8″ to 3/16″ and up to 1/4″ most of my strips were 1/8″ thick. Which meant that to create a 3″ thick stem I needed nineteen strips. Each strip needed to be buttered with epoxy and with so much surface area that turned out to be about 850ml of epoxy or nearly a whole can. If all my strips were thicker I would have used much less epoxy. The lesson that I learned is that when laminating use the thickest strips that the mould will bear. Then Fortunately Patrice came out to help me with the laying out of the stem on the mould. I started this morning with a borrowed thickness planer, which allowed me to get the apron down to the specified 2″ thickness and the stem down to 1 3/4″ width. The challenge was to keep checking the length of each piece to make sure it was square. I had to use the hand planer a couple times to get it nice and square the whole length so that the thickness planer did not perpetuate the wrong angle. 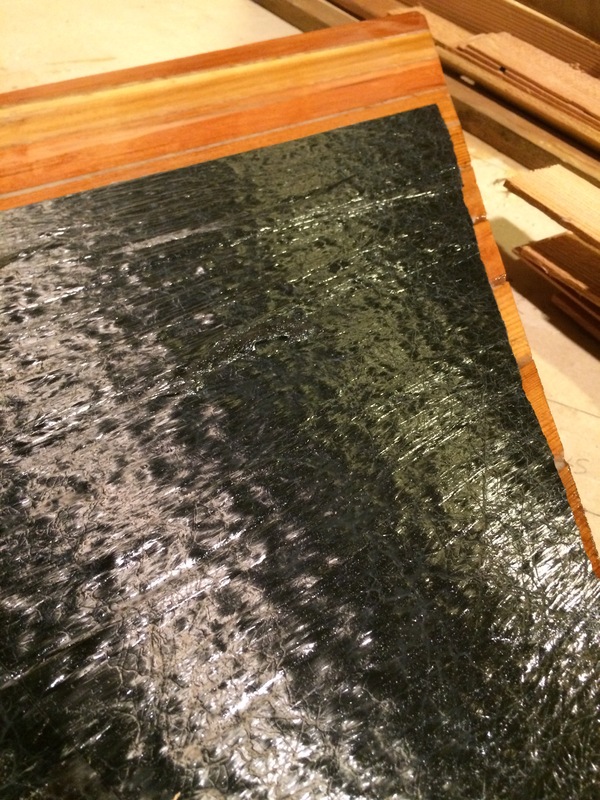 Once I finished the getting the stern apron and stem to the right width, I started on the bow apron glued up with epoxy and microfibres for better gap filling in the lamination and strength. On Saturday my assistant and I went to the lumber yard to get one more 2×3 to rip for the bow apron lamination and a couple 2×4’s that may end up being used for the floor timbers. it was suprizingly chilly saturday, we got rain, wind and hail. my assistant is ready to help me separate the apron and stem from the mould.